Wedding Photos of Doc Holliday and Big Nose Kate. Contributing Editor Maggie Van Ostrand’s article on “Big Nose Kate” recently brought her a most interesting letter from Tasmania. What follows is the email from Mr. John Bullock, who has come into possession of the wedding photos of Doc Holliday and Kate. The photos have been authenticated by Maciej Henneberg, Professor of Anthropological and Comparative Anatomy at the University of Adelaide. It’s hoped that someone might shed some light on how the photos made their way so far from Texas. Any responses sent to editor@texasescapes.com will immediately be forwarded to Mr. Bullock. This pair of wedding photographs I bought at a trash and treasure market two years ago. I asked the seller where they came from, and he said from a farmhouse in Huonville, a small town in the south of Tasmania but knew nothing more. At that time I did not realize that they were Doc and Kate, if I had I would have gotten his name. I can not now find him. I have placed pictured advertisements in the Huonville News offering a reward for information about the photographs and a news article was published in the Huonville News. Both yielded no replies, but somebody out there knows where they came from. The photographs measure 20 inches by 14 inches and are in gilded brass frames with bow-fronted glass. 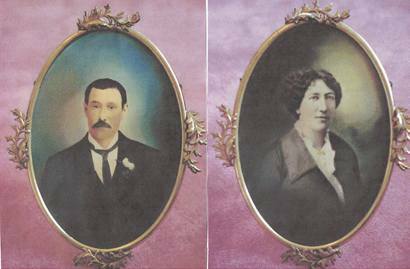 They are, I am sure, the wedding photos of John Henry ‘Doc’ Holliday and Mary Katherine Harony ( Big Nose Kate). The photos are albumen prints enhanced with aniline retouching, and are marked on the reverse in pencil 169 and 170 - making them a pair. They were printed by the I.D.C. which later became the Ideal Photo Company managed by D. P.Morgan who operated in Cripple Creek Colorado circa 1890. Also on the back are the numbers 23-4 which I think indicates the date when they were printed. Kate, in her interview with Bork and Martin in Prescott in 1935 told them she married Doc on the 25th of May 1876. I wonder that after nearly 60 years her memory slipped and it was the 23rd of April 1876. I know that in the USA they print the month before the day, but some European photographers in the USA still used the day before month. For example the photographs of the hanging of Lincoln’s assassins taken by Alexander Gardner (a Scotsman). I think that the photos were taken in St. Louis in 1876 as it is reputed that they were both there at that time. I believe that they are wedding photos as Doc is in formal day wear and has a bouquet appearing to be a Gardenia in his left lapel, the Gardenia is a springtime bloomer which would be good for April. I have tried for a long time to trace the I. D. Co to St Louis at that time with no result, but I think that the numbers 169 and 170 would make them very early works by that company, and that they may have moved elsewhere before being recorded. The photographs went with Doc and Kate when they arrived in Fort Griffin Texas in the spring of 1878. It was there that Doc got into trouble with the law and was held in his room at the hotel, where Kate rescued him from the law by lighting a fire at the back of the hotel. While people were fighting the fire she held up Doc’s custodians and they escaped. It would be unlikely that they took the photographs with them, but is distinctly possible that they were taken by the proprietors of the hotel either Jack and Estelle Swartz of the Planters Hotel, or Hank and Elizabeth Smith of the Occidental Hotel as compensation for unpaid rent. Where they went from there is the big question! I have found other photographs from Texas in Tasmania recently. These were printed by Frank Rogers of 712 Elm Street, Dallas. So someone in Tasmania must have collected Wild West photos, but again I could not trace them as they came from a local antique shop who had them for years and did not know their origin. It would be good to find somebody in the USA that has photos by the I. D. Co. I have some printed in the 1890s but not before. Perhaps someone has clues on D. P. Morgan or the owner of the I. D. Co. in the 1870s. It would also be a find if anyone has information about Jack and Estelle Swartz, who I believe moved their Hotel to Colorado City, Texas circa 1890s. I have tried to trace Swartz’s in Tasmania with no luck, but I believe they had a son William and maybe a daughter. Where did they go? Any inroads to any of the Swartz’s who emigrated to Australia would be good news. I much enjoyed the writeup on Kate Elder. I noted with interest your evidence that the photos were wedding photos and I just wanted to comment on your evidence that the lapel flowers likely being gardenia that would be in bloom in April. I don't think it is likely that he would have found Gardenia's commonly grow in St. Louis. It is too cold for them there. Gardenia's are perennial shrubs that can grow in hardiness zones to as low as 8b (10-15 degrees F). St Louis is hardiness zone 6a (-10 to -5 degrees F) . Gardenia's would be killed by cold in the St Louis climate. Furthermore, even in the warmer 8b zone Gardenia's don't normally flower as early as April. They are late spring to early summer bloomers June-July in my experience. Old fashioned Camellias can grow in hardiness zone 7 and do bloom in the early spring. So they may be a better possibility for the flowers. However, it looks like there are two small flowers- much smaller than either gardenias or camellias normally are.